"We loved your little place, it was perfect!" "The place is very cute, and well done with the decor/improvements!" "Your cabin is cool! We had a great time and will come again." 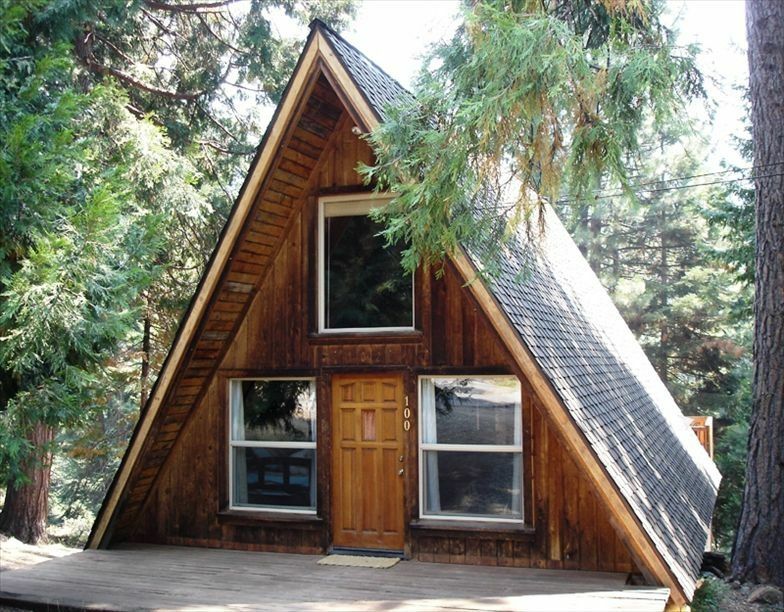 Vintage 1956 A-frame cabin with knotty pine interior and hardwood floors, situated on private, wooded property. Recently refurbished with all new and antique furnishings with a mid-century modern feel. The cabin's main room is the largest and has a comfortable sitting/TV area with Australian Cypress floors, a pull-out sofa and two arm chairs, a queen bed with quality mattress. There is a TV with cable and a DVD player, and also an iPod Speaker/Boombox (compatible with all 30-Pin Connector iPods, iPod Charger, iPod Dock and a MP3 adapter). The colorful 1950s era kitchen with original Boomerang Formica countertops is complete with a walnut extending dining table, chairs and fully equipped with necessary dinnerware and cookware. The kitchen has a refrigerator, microwave, and stovetop (no oven). The cozy loft has has two twin beds. THE STAIRS TO THE LOFT ARE VERY STEEP AND MUST BE USED LIKE A LADDER, AT YOUR OWN RISK. CHILDREN ARE NOT ALLOWED IN THE LOFT BEDROOM! This home does not have an oven, dishwasher, washer, dryer, or air conditioning. The back deck offers nice forest views, with patio furniture and a propane BBQ. Lake access to an Almanor cove is about a 5 minute walk down the rear of the property and the Hamilton Branch boat launch, swimming and BBQ areas are minutes away by car. The property has plenty of room for off-street parking and easy access to the cabin's front entrance. Lake Almanor is a hidden treasure! It's like what Lake Tahoe used to be in the old days before heavy traffic and crowds of people disturbed your stay. Lake Almanor sits at 4,500 feet elevation and is the place where the Sierra Nevada mountain range and the Cascade mountain range meet. Lake Almanor is located in Plumas County with 1,000 acres of unspoiled national forest land. Known as the Gateway to the Lassen Volcanic National Park, Lake Almanor is the southern beginning point of the Volcanic Legacy Scenic Byway, a 500 mile All American Road that traverses a chain of volcanoes. The lake has 52 miles of shoreline with views of Mount Lassen to the west and Dyer Mountain to the east. The Feather River with cascading waterfalls, named a National Wild and Scenic River, flows into Lake Almanor. Lake Almanor draws visitors from all over. It is known for excellent year round fishing and picturesque streams for fly-fishing. In the spring, trout and salmon fishing is especially good. Summertime offers swimming, boating, water-skiing, sailing, sail boarding and jet skiing. Lake Almanor Recreation Trail, a paved 9 1/2 mile trail that follows the contours of the west side of Lake Almanor, is perfect for hiking, biking and inline skating. Golf is also popular at Lake Almanor with ten courses in the area. Winter sports enthusiasts enjoy cross-country skiing as well as snowmobiling trails. A great time to experience all of the natural beauty of the area is in autumn when Lake Almanor is dazzling with colors. In the nearby town of Chester, visitors can browse Main Street with its unique shops or dine at one of the many great restaurants. Also close by is Westwood where you'll find the Bizz Johnson Trail, the longest and arguably the most scenic, rail-trail in California. It is a 30-mile trail open to hikers, bikers, horseback riders and cross-country skiers. SHEETS, TOWELS AND PAPER GOODS ARE NOT PROVIDED. Dining table located in kitchen. There is also an outdoor patio table that seats 4. An iPod Speaker/Boombox (compatible with all 30-Pin Connector iPods, iPod Charger, iPod Dock and MP3 adaptor). Sheets, towels, and paper goods are not provided. Great value and ‘home away from home’!! We loved our stay for the week and it was everything as listed. The home had a freezer which the listing said it didn’t have. Everything else was clean, as stated, and very roomy for two of us. We would recommend this place to anyone looking at this listing! We will definitely come back to this listing later this year and/or early next year. I thought it was a great cozy little place. Nice and quiet with all the comforts of home. The market was perfect distance for a nice walk and the surrounding area was gorgeous. I would love to come again!